Who doesn't know Beyonce stole my dress, gave it to Roberto Cavalli to restyle and used it for the Lemonade video. Common, Who doesn't love her freedom lemonade dress, I fell in love with it at 1st sight, I love the dress even more than the music, her stylist did a good job. So what you thinking of my spaghetti strap layered mustard maxi dress with ruffle design, lemonade enough or not? I like the busy style, festive and classy touch all in one look. It is light, comfortable, versatile and perfect for summer. Wear it with sneakers or heels and you are good to go. 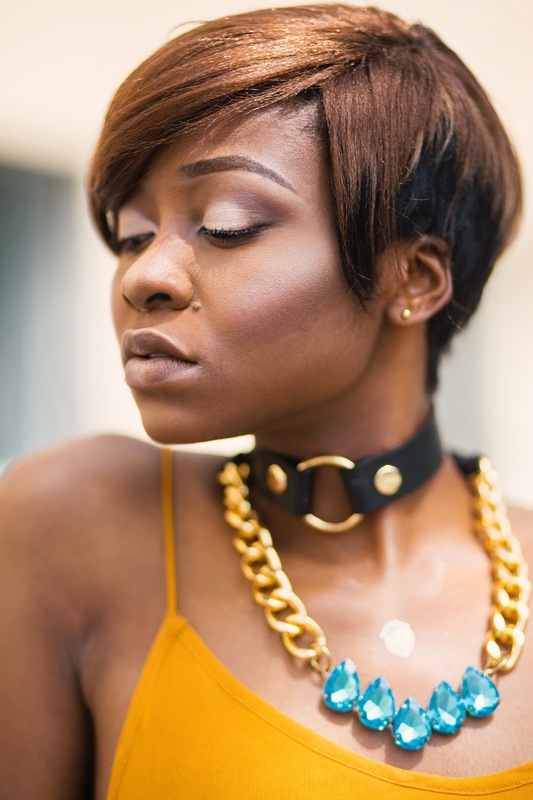 Chok me baby, wanted a choker so outstanding and i just found one, this Gold circle leather choker from Na-kd is just perfect for me, i added my gold chain necklace and blue stones from Taro Collection and its a yes for me, i love the stones. Get my decorative strap flower heels by clicking on the link. Use the discount melodjacobs20 to get up to 20% off your order at Na-kd.com. Na-kd.com, an online store with lots of classy and affordable items, the designs are so unique and stylish, summer wont be complete without those summer basics, especially the free spirited dresses, so lets shop together, go get a pair or pairs from the online, make summer fun. Thank you much for stopping by, please subscribe, let take our friendship to the next level. Share,comment and keep viewing. Are you following me on Instagram (MELODYJACOB1) and snapchat (MJBLOG)?